Chapter 1: Thalamostriatal synapses—another substrate for dopamine action? 7 Does Glutamate Corelease Mediate a Reward-Relevant Signal? Progress in Brain Research is a well-established international series examining major areas of basic and clinical research within neuroscience, as well as emerging and promising subfields. 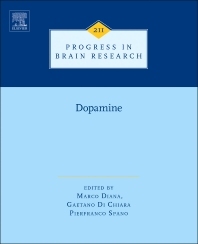 This volume, concentrates on state-of-the-art of dopamine research: from basic science to clinical applications. It covers topics including thalamostriatal synapses as a substrate for dopamine action; the multilingual nature of dopamine neurons; ethanol-mechanisms along the mesolimbic dopamine system, and much more. Progress in Brain Research is the most acclaimed and accomplished series in neuroscience, firmly established as an extensive documentation of the advances in contemporary brain research. The volumes, some of which are derived from important international symposia, contain authoritative reviews and original articles by invited specialists. The rigorous editing of the volumes assures that they will appeal to all laboratory and clinical brain research workers in the various disciplines: neuroanatomy, neurophysiology, neuropharmacology, neuroendocrinology, neuropathology, basic neurology, biological psychiatry, and the behavioral sciences. This volume looks at dopamine research in the light of the newest scholarly discoveries and insights.